These top-loading balances offer students hands-on experience with manipulating the poises. Positive poise positioning ensures repeatable results, and magnetic dampening minimizes oscillation and speeds up weighing. Built-in locks minimize wear, prevent tampering, and provide protection. 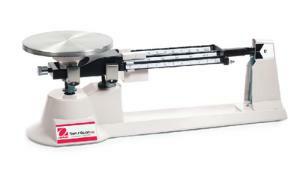 The balances also feature an easy-grip carrying handle, which is ergonomically designed for easy transportation, and a convenient storage compartment for the weight set. Balances include a security loop for locking with a security locking cable, available separately. Sensitivity is 0.1 g, the front beam is 10 x 0.1 g, the center beam is 500 x 100 g, and the rear beam is 100 x 10 g.
Ordering information: Three-year manufacturer's warranty is included with purchase.